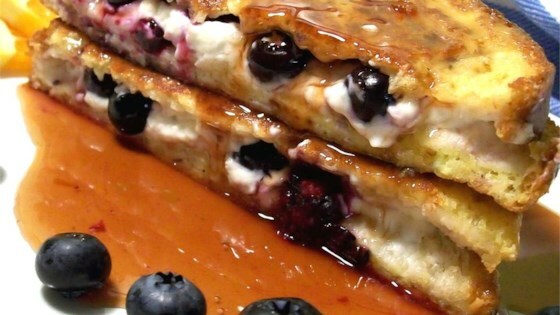 "Fresh blueberries and cream cheese sandwiched between two slices of bread, topped off with homemade orange maple syrup." Bring the red wine, orange juice, and orange zest to a boil in a small saucepan; reduce heat to medium-low and cook for 5 minutes. Pour in the maple syrup and crushed red pepper flakes. Continue cooking 5 minutes more; reduce heat to warm and keep the syrup hot. Meanwhile, spread one side of each slice of bread with the softened cream cheese. Press the blueberries into the cream cheese and sandwich two pieces of bread together with the cream cheese on the inside to form the sandwiches; set aside. Beat the eggs in a mixing bowl; whisk in the milk until smooth. Melt the butter in a large skillet over medium heat. Dip the sandwiches into the egg mixture allowing the egg to soak into the bread; allow excess egg to drip off. Cook the sandwiches in the hot butter until golden brown on both sides and the bread is no longer soggy, about 5 minutes per side. Serve with the hot orange maple syrup. So easy! I did not use the red wine or the red pepper flakes in the syrup and it still came out great! I also used cinnamon swirl bread from a local bakery. I will definitely make this again! Sooo Good! The whole family loved it!